On Sunday 4th March I packed up my dresses from the boutique and headed to the Titanic Hotel Liverpool, a uniquely different wedding venue located on the Stanley Dock. Once a busy warehouse, now a hotel full of character perfect for weddings and events. having attended their last wedding fair in October 2017, I knew I wanted to go back! The wedding fair was set out over a few different locations within the hotel itself. Myself and other exhibitors located in the Rum Warehouse, a beautifully renovated 1950’s warehouse, now an amazing exhibition space and blank canvas for your wedding ideas! Rum Warehouse is a generous venue accommodating up to 500 guests for a seated wedding breakfast. Due to the grand scale of the venue you can invite everyone from your nearest and dearest to your distant cousins without ever worrying about invitation lists! The bridal catwalk itself took place upstairs from the Rum Warehouse in the mezzanine area. 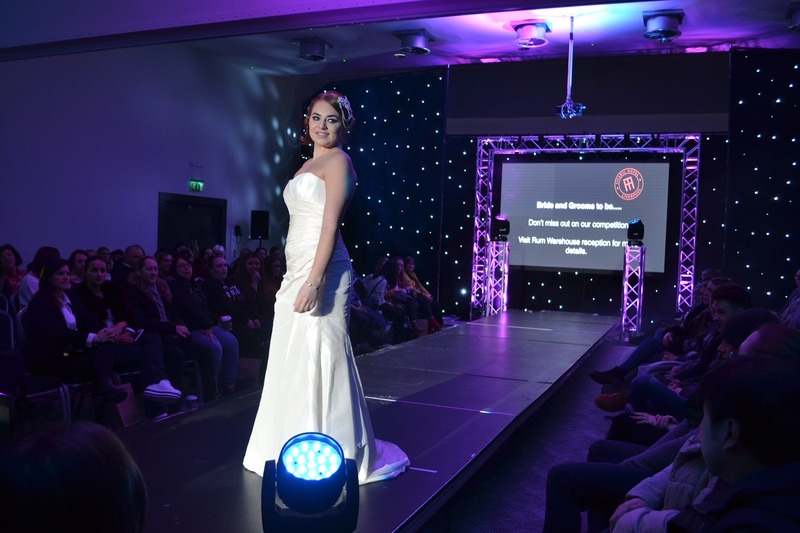 The stage set by The Big Event Group was just spectacular, creating an amazing runway and backdrop for our models to strut their stuff and showcase our Bridal Reloved Liverpool preloved, second hand and sample designer wedding dresses. We were joined on the catwalk with other amazing suppliers – Groom menswear, Rocks for Frocks and makeup from Sococo Rougue. The music boomed and the brides and grooms in the crowd loved seeing all the ideas for their big day. There’s also another hidden gem within the Titanic Hotel, West Bay. The West Bay is an exceptional new wedding venue reflective of their rich maritime heritage and restored warehouse design. It’s stone floors, steel pillars and vaulted brick ceilings are perfectly in keeping with the distinctive style of the hotel and venue. Floor to ceiling windows offer striking views of the dock and the outdoor space on the colonnade is ideal for summer drinks receptions. So in September 2018 for the hotels next wedding event keep your eyes peeled as you won’t want to miss out!